Conventional wisdom says that branding is really important. It drives higher value, promotes loyalty. etc etc. Well in the USA that doesn’t seem to be the case. Travel is a chronic under-spender in the category of advertising. But worse how its spent shows that the US at least has totally wasted a significant amount of its ad spend by going after direct response. In airlines that probably means that branding on the planes is irrelevant. Have a look at this chart. 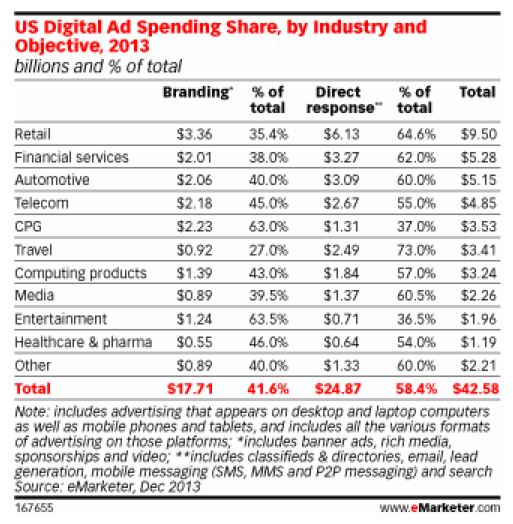 This is from eMarketer. Its scary in its direct numbers. Let’s look at the context. Travel is 5% of the total US GDP. The US GDP in 2012 was $15,684.80 billion US dollars in 2012 http://www.tradingeconomics.com/united-states/gdp . Travel’s value was $855.4 billion http://www.ustravel.org/sites/default/files/page/2009/09/EconomicImpactTravelandTourism2013update.pdf. Travel as a category represented 8% of the total ad spend so as a category it punches above its weight. This should help put to rest whether price matters. Of course it does and price advertising in Travel is the door opener. If you dont tell people you have a price deal that they can assess in the opening moments of their decision process – you WILL BE EXCLUDED from the sale. Sadly this points to some bad habits by brands and a continued shoveling of cash at Google. Think about that as you set up your ad plans for next week’s campaigns. 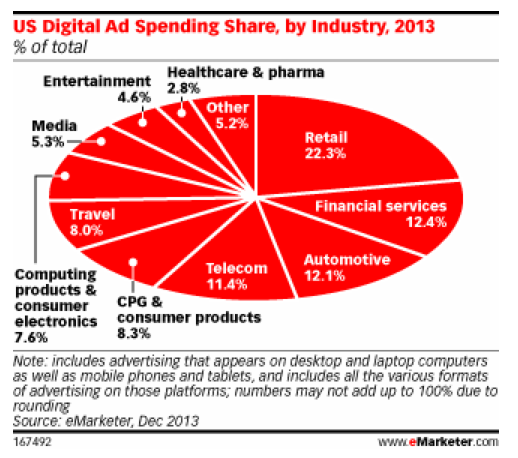 (Images taken from eMarketer email). But go to the original chart and you see that in fact Travel has the highest disproportionate spend of any category of brand vs Direct Response.